Long time no blog! We have finally completed most of our planning for our 2015 gardens, and I have some exciting things to share with you. We’re going to start out today by looking at Bed 1, which is quickly gaining the reputation of being the mish-mash garden, the random garden, or the variety garden. I don’t remember what name we finally decided on for last year, but it was rather a conglomeration of different things last year, including the quinoa and the Italian vegetables. Let’s take a look at this year’s plans for The Random Garden. As you can see, this bed has a lot going on! We also have plans for each season. The first part of the bed is planted to 2 different varieties of Summer Squash: ‘Segev’ and ‘Partenon.’ These squash varieties are parthenocarpic. Yes, I know that’s a big scary word. Basically, it means that unlike other squashes, these varieties do not need pollination in order to set fruit. Why choose one of those varieties? Because we can cover them with row cover for the entire season in hopes to protect them from squash vine borers! We’ll have to see how that turns out! 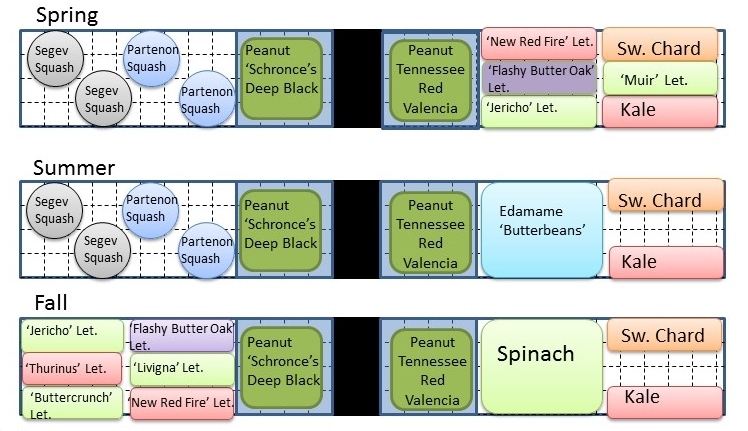 In the center two sections of the garden we are trying two different peanut varieties. ‘Schronce’s Deep Black’ has black skins inside the peanut shells. ‘Tennessee Red’ is a Virginia type that is supposed to be earlier maturing. The other end of the bed is a lettuce/salad green garden. We have selected several varieties of lettuce that feature different colors, leaf shapes, and types. We also have ‘Maribor’ Kale and ‘Electric Neon Blend’ Swiss Chard that we hope will grow through the summer and into the fall. Once the spring lettuce is done, we are following that with a planting of Edamame (soybeans that are eaten at the green stage, like in Japanese cuisine). The variety we chose ‘Butterbeans’ is supposed to be high yielding and flavorful. After the edamame, we will plant spinach for the fall.